4/5/2018 - Proven Winners® Double Take Pink™ Chaenomeles took the 2018 Silver FLORALL Award for best new variety at the March 6 Belgian trade fair, FLORALL, founded by the Belgian Nurserymen and Growers’ Federation and the Royal Society for Agriculture. The competition focuses on new plant cultivars from the widest possible range of the area’s horticultural sector. The submissions were evaluated by the jury committee prior to the event and the Golden, Silver, and Bronze FLORALL Award-winning plants were on display at the single-day fair. Evaluations were based on factors such as the quality of the plants, the innovative aspect of the new variety, its added value within the existing horticultural range and its distinguishing quality. 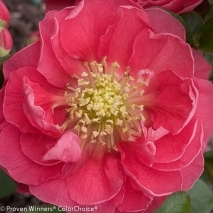 Double Take Pink™ Chaenomeles is flowering quince (C. speciosa ‘Pink Storm’) from Proven Winners® and is propagated exclusively by Grand Haven’s Spring Meadow Nursery. Double Take Pink™ quince produces a spectacular display of double, camellia-like flowers on stems that are completely thornless. All five varieties in Double Take™ Chaenomeles series are heat and drought tolerant and develop little to no fruit. Developed by Dr. Thomas Ranney and his team at Mountain Horticultural Crops Research & Extension Center in Asheville, NC, the plants were submitted to the FLORALL Award competition by Willy De Nolf Nursery in Waregem, Belgium.